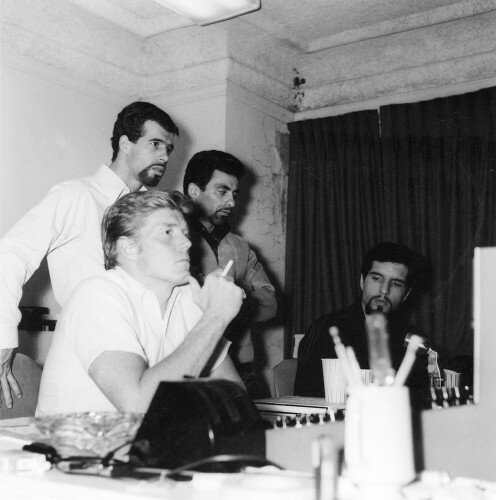 The three geniuses–Bob Crewe, Bob Gaudio, and Frankie Valli (and an unknown guy) are all looking a little tired & serious. Maybe it was an all-nighter in the recording study. Found this photo on http://thatfourseasonssound.typepad.com/. Does anyone have any details about this photo? Thanks, Danielle. Mikey Petrillo co-wrote Tell It to the Rain with Angelo M. “Chubby” Cifelli. The Four Seasons recorded it in December, 1966 & this great song peaked at #10 on the Billboard Hot 100 in 1967. Maybe this photo was taken during the recording?